Have you forgotten your WordPress Admin password? Do you need WordPress password recovery? Did you lose access to your WordPress because you fell prey to the WP password vulnerability and your WordPress password was hacked? (Problem was corrected with WordPress 2.8.4.) Take heart, the recovery of your WordPress password can happen outside of WordPress by using phpMyAdmin. phpMyAdmin allows you to directly edit your WordPress database! You can totally and permanently ruin your WordPress installation and have to start it all over again. While I have attempted to make this tutorial easy-to-follow and and accomplish, I take no responsibility for any problems that may occur from your modification of your WordPress database. If you are not comfortable with attempting to work on your WP database yourself, find someone technically competent to assist you in restoring your password. When you set up your web hosting, your webhost likely gave you the login and password to your account. Your account is the place where you set up your email addresses and the like. Most web hosting companies use CPanel as an interface. CPanel makes life much easier! Anyway, you want to log onto your web hosting account and find phpMyAdmin and click it. Locate the “user_pass” row in the field column. 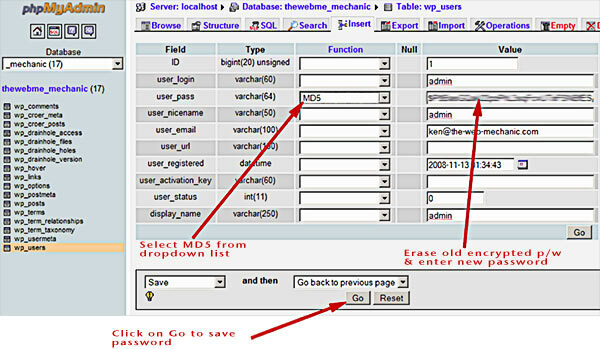 In the “Function” column of that row, click on the dropdown list and select “MD5”. Continue to the “Value” column. What you will see there is an encrypted version of the current password. To enable your WordPress password recovery, click on the encrypted version and remove it so that there is nothing in that box. Now, enter the WordPress password that you want to use for the “admin” account. Don’t worry that it isn’t encrypted, that will be taken care of automatically. Lastly, at the bottom of this last screen, be sure to clock on “Go” to save your change of password. Congratulations! You should now be able to log into your WordPress with your new password! Concerned about doing your own WordPress password recovery? Contact the Web Mechanic and he’ll do it for you for less than $30!